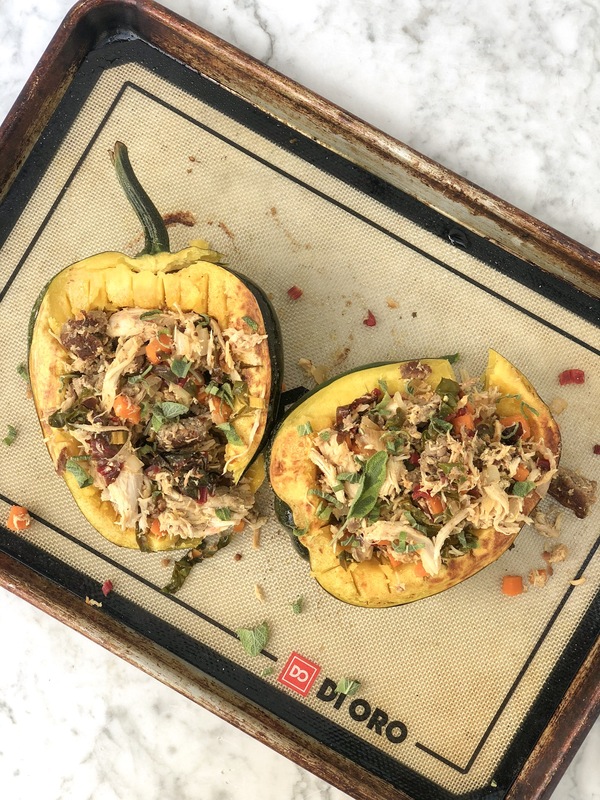 This is a great recipe to utilize acorn squash which is in season and readily available right now. 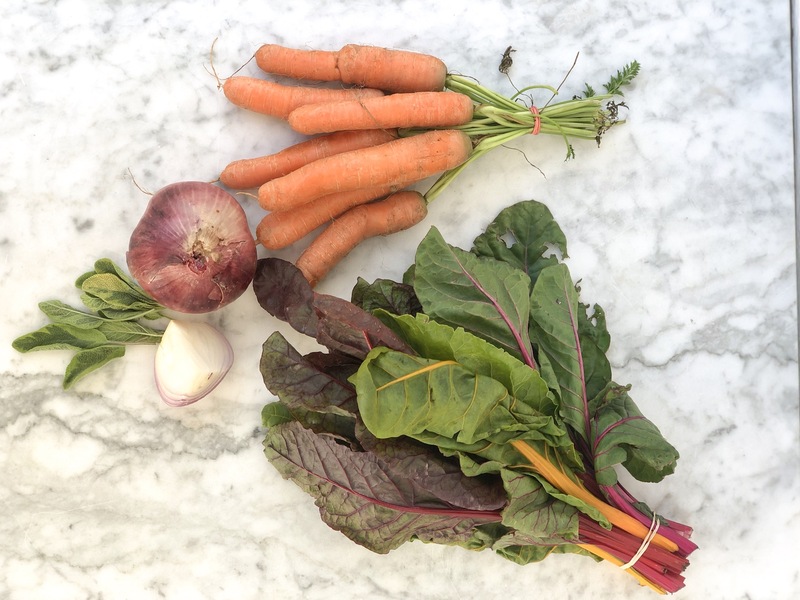 It also uses rainbow chard which I have been seeing often at our local markets. You could use any veggies you love in this recipe, though. I love incorporating autumn veggies into dishes this time of year. 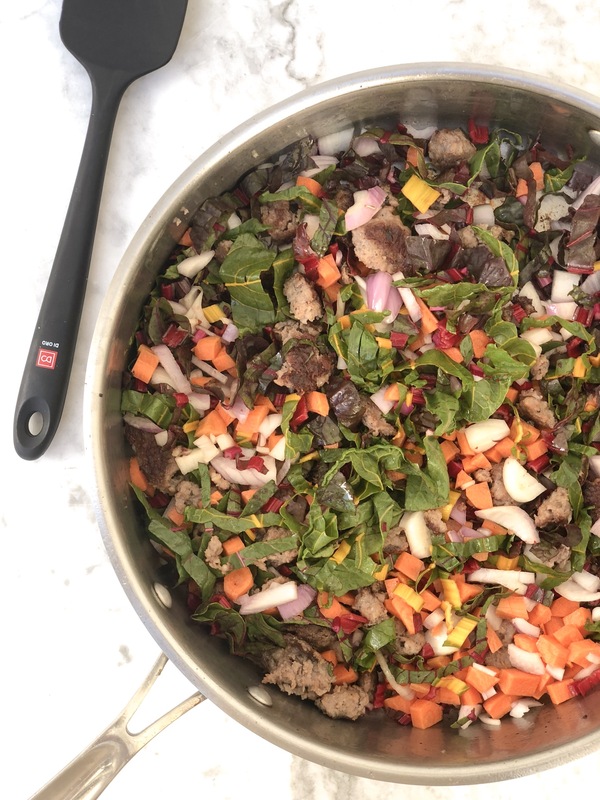 It is also protein packed with chicken and sausage and makes for great leftovers or meal prep options. 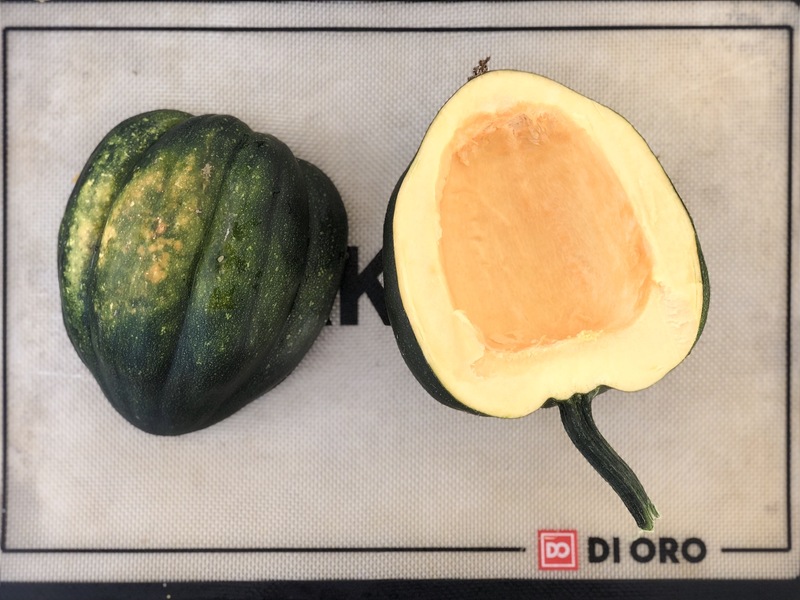 I love using the DiOro baking mat to roast squash. I spritz it with a little spray avocado oil and a sprinkle of salt. I roast it facing down on the baking mat at 425 degrees for about 25-30 minutes while I make the filling on the stove top. 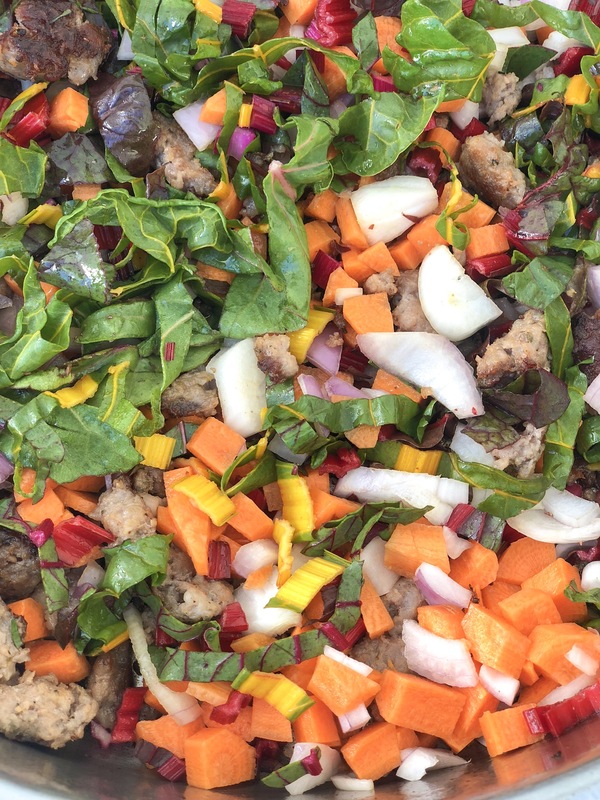 I had a plethora of farmers market veggies and I love to use rainbow swiss chard in mixes like this. I also used carrots, shallot, and sage in my mix of sauteed autumn vegetables. I had pre-cooked roasted chicken that I shredded and used in this recipe. I threw that in last. I used fresh pork sausage and sauteed that first. Then I added the veggies. I chopped the veggies all about the same size and added them to my large skillet with the browned pork sausage. 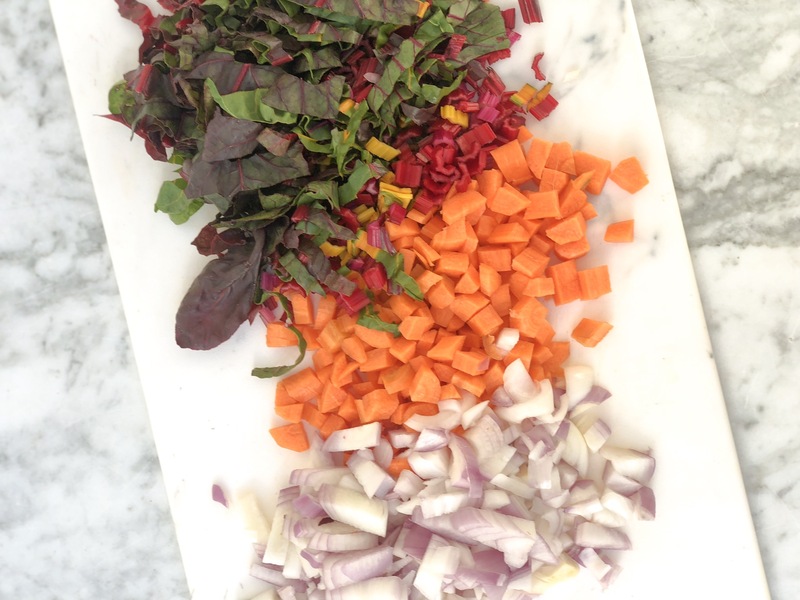 I love the bright colors in the autumn veggie mix. It goes so nicely with the acorn squash. You could use any mix of veggies you like. Onion, carrot, celery would give it a Thanksgiving stuffing feel. Beets or sweet potato would be a great addition. I love using the DiOro Spunula to mix my sauteed veggies in the skillet. It does not burn or melt if it rests on the edge of a hot pan. It is perfect for scraping up the good brown bits from the bottom of of the skillet. I added a spalsh of Apple Cider Vinegar to the mix toward the end of sauteing to help de-glaze the pan and incorporate the carmalized bits on the bottom for flavor and color. Wash then slice the acorn squash in half. Scoop out the seeds and clean the center. Spritz the squash with an avocado oil spray and sprinkle with salt. Heat oven to 425 and roast for about 25 minutes face down on the baking sheet. Prepare your filling on the stove top. Brown the pork or chicken sausage first. Add the chopped veggies to the sausage mix and saute until slightly cooked through. Add the apple cider vinegar to de-glaze the pan. Add garlic and salt and pepper to taste. Mix in the roasted shredded chicken. Remove squash from the oven and add the chicken and veggie filling. Roast for about 5-10 minutes. Garnish with freshly chopped sage.